Volkswagen Golf 1.5 TSI EVO 150 R-Line 5dr DSG 2019 Review | What Car? What Car? will save you at least £2,376, but our approved dealers could save you even more. The Volkswagen Golf continues to be one of our favourite family cars. It's practical, tidy to drive, comfortable, and the infotainment system is very well equipped and easy to use. 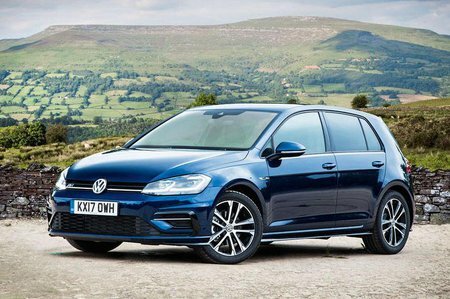 If you are looking for something that's plusher than the cheapest in the class, such as the Skoda Octavia, Ford Focus and Vauxhall Astra, but has a bit of upmarket presence and feel, then the Golf merges those two worlds very well indeed. Mostly styling changes that include more aggressive-looking bumpers, lowered sports suspension, twin oval exhaust tailpipes, black brake calipers and carbon-look interior trims . This more powerful 148bhp 1.5-litre adds more pace and guts if you're regualrly carrying lots of people and luggage. It can still top 50mpg in real-world conditions, so it's worth thinking about if you need that added zip.